L’Artisan Parfumeur looks to the roots of perfumery for its new collection: La Collection de Grasse (The Grasse Collection). In recent years, exotic travels have fed the creativity of L’Artisan Parfumeur and its perfumers, now the French perfume house returns to the mythical home of fragrance. The collection will debut this October with two stunning candles - L’Automne (autumn/fall) and L’Hiver (winter). In parallel, L’Artisan Parfumeur will launch a truly luxurious and surprising new product: scented leather gloves, perfumed with its iconic Mûre et Musc Extrême fragrance. L’Artisan Parfumeur was inspired by Grasse, spiritual home of perfumery, and most specifically by the Grasse “arrière-pays,” or back-country, where mountains and Mediterranean meet. With the passing of the seasons, this fragrant landscape is alive with colours, and fleeting emotions. This new collection is also L’Artisan Parfumeur’s celebration of French artisanal heritage. These two L’Artisan Parfumeur candles transport you to the Grasse back-country, creating a warm and cosy atmosphere for your home, redolent of the seasons. For the Grasse Collection, L’Artisan Parfumeur imagined a new handmade vessel to house the candle, and sought out other artisans, ceramic masters from the other side of the world, based in the Chaozhou region of China. Available in two sizes 200gr (for over 60 hours burning time) for 55GBP and 1.5 kg (for over 100 hours) for 220GBP. Spring 2013 will see the release of two more candles: Le Printemps and L'Ete. L’Automne A stroll through the wild landscape surrounding Grasse, where leaves and nuts fall onto the humid earth. This candle recreates this special muffled atmosphere, where leaves on the ground soften the sound of footsteps. The air is getting fresher, and more humid, the light is getting paler, comforting as the wind picks up. At first, we detect a lavender note, which carries us into the countryside, then chestnut, caramel and blackcurrant notes. Finally, a cedar and lichen accord brings to a close this promenade in the Grasse back-country. L’Hiver A gathering around the fireplace, surrounded by the comforting scents of smoky woods and pine needles.This candle is highly-evocative. Imagine being by a burning fireplace, safely tucked-up inside, when all outside is cold and dark. At L’Artisan Parfumeur, the winter season is often a time for reunions with those you love, moments filled with emotion. So, the ingredients were chosen with great care: clary sage, married with notes of pine and fir tree from around Grasse, to create this welcoming wintry scene. The process of ‘scenting’ the leather was developed after extensive research by L’Artisan Parfumeur. The leather (the ‘raw skin’) is soaked for four hours in a very specific mixture of nourishing oils and the specially-developed Mûre et Musc Extrême concentrate. This process softens and scents the leather. The leather is then removed from the mixture and placed in a special drying-room, to be left to dry overnight. The mixture of oils and the Mûre et Musc Extrême concentrate results in the leather of the gloves being elegantly perfumed for around three years. The gloves can also be re-scented using the Eau de Parfum Mûre et Musc Extrême, without staining the leather. The history of the House of Causse is closely entwined the glove-making workshops of Millau, in the South of France. The expertise of these workshops has ensured that Millau has become the glove-making capital of France. Causse is officially celebrated as an “Entreprise du Patrimoine Vivant” (a company seen as part of France’s cultural patrimony). Causse gloves are still designed and made locally, by hand, with the same love and attention to detail. Far from being anachronistic, this painstaking artisanal work has found new meaning with L’Artisan Parfumeur and relevance to contemporary perfumery. 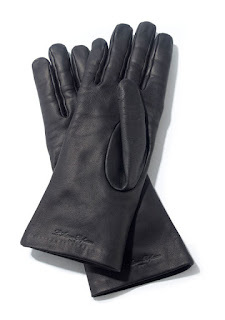 The beautifully soft black leather gloves, available in fours sizes (XS, S, M, L) fit your hand perfectly. The kid leather, of French provenance, is of outstanding quality, perfectly supple and soft to the touch, offering great comfort, as well as that certain French elegance. When you remove the glove, your skin is delicately scented, impregnated with your favourite fragrance. The Mûre et Musc Extrême scented gloves, lined with natural silk arouse the senses of both touch and smell. Only 100 pairs are produced, available from October 2012 in selected L'Artisan boutiques for 320GBP. This year, with L’Artisan Parfumeur, Mûre et Musc Extrême will fit you like a glove! I couldn't care less about those candles and stupid gloves, I want the reissue of L'Artisan Parfumeur Oeillet Sauvage, that's what I want! Could one get a powdered wig to go with them? Very richly decadent in a classic way. Surely you'd have to buy the matching perfume to coordinate properly? I am not surprised about the scented gloves. I remember reading somewhere that perfume was once made to serve a very functional purpose as the hides that were used to make leather gloves smelled so awful that there was a process of liberal application of a perfume oil blend to mask this horrendous smell. I have not owned a pair of leather gloves for many years. However, when I was a young lady living in a large city and commuting to work via public transportation during cold winter seasons I owned numerous pairs of leather gloves. It was in the heyday of my perfume obsession and liberal and frequent application of classic/vintage scents to my wrist (back then these scents were readily accessible and affordable) combined with the leather left a unique and distinct odor that lingered on the gloves for just about forever! I understand why people are attracted to "leather" fragrances. So they are traveling to Chaozhou in Guangdong province for their clay pots! Chaozhou potters are renowned as the best throwers in China and are in demand to work in the teapot factories of Yixing. Interesting! I am planning to make a trip to Chaozhou early next year to by some teapots and furniture. I shall keep an eye out for seconds of the candleholders( sans waxe of course, I'm sure the pouring is done in France). the gloves sound decadent. I do wish they'd bring back some of their limited editions as well: Oeillet was great, so was Jacinthe et Bois. If you need another decant of the Oeillet, let me know. ah, buying matching products reeks of marketese. I hope they don't go that length. The gloves idea appeals to me somehow. indeed leather gloves (and leather goods in general) was probably the single most influential factor of bringing perfumery into Europe. The gloves do retain scent perfectly, which makes them perhaps a very influential scented souvenir to "forget" behind...this was done quite a bit in romantic literature of the 19th century, as I recall. that should be a great trip! I hope that your Chaozhou experiences prove to be fruitful in the best possible sense. I'm quite certain the actual pouring happens in France as well. Not only an irrelevant comment with spam, but even the spam link doesn't work. Pathetic. I feel an urge to go the DIY route, I have a few sheets of nice nappa leather I meant for a tank top; I can sew and... well. Sky is the limit. And I don't like Mure et musc that much anyway, while something properly leathery, such as birch tar, would be much cooler. I'm actually perfuming my fans. Comes handy in the July tram as this country hasn't adopted deodorants and daily showers really wholehearatedly yet.